I was super excited to find these Stabilicers LITE at LL Bean this past week. They fit over your sneakers and are advertised as snow tires for your feet! Just what I need if I am going to run through this snowy winter in NY. The sales representative highly recommended them. He said most of the sales associates there used them while running and loved them. SOLD! And for 20 bucks I was on my merry way home to try them out. The Stabilicers LITE are made of a rubbery material. They are easy to get on and they fit very snuggly over your sneakers. My sneaker didn't move in them or slip around at all. 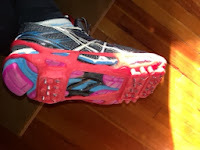 I ran 4.3 road miles in them in a mix of fresh snow, packed snow, slush, wet areas and somewhat clear and dry pavement. The metal studs on the bottoms felt weird on pavement. I felt unsteady at first but that went away as I got used to them. They did a good job providing traction in the the snow and slush. The sound and sensation on the patches of wet and dry pavement was hard to get comfortable with. Overall my pace wearing the Stabilicers LITE was significantly slower than my usual pace, by almost a minute per mile. My legs also felt pretty tired pretty quickly. To be fair, however, I am not used to running in the snow so it could just be the nature of snow running. I felt really safe in them toward the end of my run. I only slipped once at the very end and in really deep snow and slush around a turn. My left foot was sore immediately after the run. I noticed a hot spot on the inside of my foot. It looks like it may end up a blister. My socks were wet so it could be from the combination of my feet being wet and having a wide foot. Stabilicers LITE are designed to be super tight so they press on your sneaker. This proved tight for my wide foot! More troubling was noticing the 4 stud indentations on the heel of my left foot, I assume from the studs on the bottom of the Stabilicers LITE. I'm not in pain but my left foot is definitely a little sore.